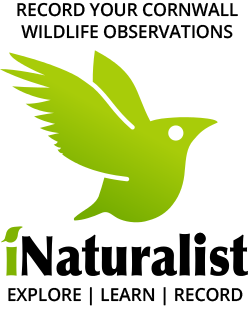 The Cornwall Conservation Commission has launched a wildlife observation and recording project through iNaturalist.org. Cornwall residents can now use iNaturalist.org to record the wildlife (plant and animal) you see in our town, meet other nature lovers, and learn about the natural world. Post your own sightings and see what others have already posted. Go to http://www.inaturalist.org/projects/cornwall-vermont-wildlife-observation and bookmark it for future use. When signed in, the Add Observations page should appear. Fill in as many of the fields as you can, particularly the name of the animal/plant/fungus etc, as well as the time and place of the observation. You may click on the map to show the place. If you would prefer to hide the location, then click on “Change geoprivacy” below the map. If you click “Private” it will record, but hide the location. If you click “Obscure”, it will show your sighting in a variable random location. Add a photo! Game camera night photos are ok too. If you have additional information, click on “View all fields” and add the rest there. When you are finished, click on the blue button “Save Observation” on the lower left. That’s it! If you want to see other Wildlife Observations sightings, scroll down to the bottom of the thumbnail pictures and click on the link that says “More Observations.” This will take you to the “Observations” page. 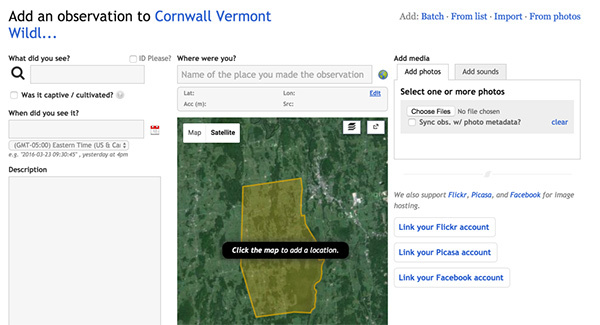 Enter “Cornwall VT” into the Location Window and click on “Go.” This takes you to a map of the town with all the project sightings. Click on your username in the upper right hand corner and scroll down to Logout. iNaturalist apps for phones and tablets can be downloaded from iTunes or Google Play. Once the app is installed, click on it to launch. Enter species name or press on the magnifying glass to search. Add to Cornwall Wildlife Project by pressing “Select Projects” and then select appropriate project. You can set geoprivacy to open, obscured or private. Tap on “My Observations” in upper left. If in Cornwall you can press the “Nearby” button and The CWP will pop up to click to add. Or, you can enter Cornwall Wildlife Project into the search bar.